(Jan. 7, 2019) -- Ariana Moncada is a senior double majoring in math and statistics at UTSA. This coming spring, she will be only one of 20 students from across the U.S. to participate in a mini-semester program at the National Renewable Energy Laboratory. This exclusive research facility is a government hub that develops the latest breakthroughs in new clean technologies. 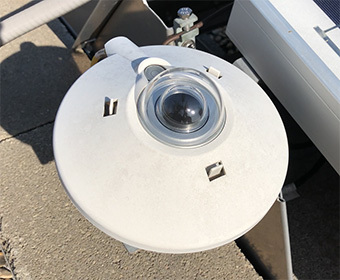 Close up of the pyrometer used to calibrate the Sky-Imager irradiance observations. The UTSA student fought hard and won admission thanks in part to her work in developing UTSA’s Sky-Imager, a solar forecasting technology that uses machine learning to help the City of San Antonio determine how much solar energy to expect from local solar panels. We spoke to Ariana about this incredible internship opportunity. Can you describe your work with the Sky-Imager? I analyze images and weather data captured by the UTSA Sky-Imager, and I create machine learning models to forecast solar irradiance. The solar irradiance then can be used to predict how much power solar panels can produce. How did you feel when you were notified about your acceptance to the NREL program? I was ecstatic! I’ll get to see with my very own eyes research at “THE” renewable energy lab. Although, I’ll admit, reality still hasn’t set in yet. I still can’t believe I’ll be visiting soon. Why do you like to work in the energy field? Everyday, for everything, we all need electricity and behind electricity are energy sources like solar. That’s my drive, knowing that the work I do really does matter and affects us all. What would you tell other women and minorities about applying to top internships in the country? I would tell them apply, apply, APPLY! You may surprise yourself at what you are capable of and what other people see that you are capable and deserving of. You lose nothing by applying and just getting your name out there is very important. The sky is the limit. What is the one class at UTSA that has been the turning point in your educational career? It actually wasn’t a particular class. Going to Professor [Walter] Richardson’s (my faculty mentor’s) office hours and asking him about his research was what changed everything for me. He took a chance and believed in me, and working with him has opened up many opportunities. You are the first Hispanic female student from UTSA to be admitted to the NREL mini semester program. What does that mean to you? Personally, it means that all my hard work really does pay off. Most importantly, I hope I empower others just like me to push past the difficulties—that being Hispanic and female doesn’t define all of who you are and have to offer. You have abilities, passions, motivations and qualifications just like any other, so you can do great things too. Learn more about at the UTSA Department of Mathematics. Learn more about at the UTSA Department of Management Science and Statistics.